If you're in the market for a camera drone, things just got real. Last week, DJI updated its ubiquitous Phantom series with a 4K video version. Today, 3D Robotics (makers of both consumer and professional craft) ups the ante with Solo -- a stylish "ready to fly" quadcopter that challenges the Phantom (on the 'copter side of things) in quite a few ways. You'll need to bring your own camera though. Top of the 3DR Solo spec-sheet are twin 1GHz Linux computers: one in the drone, one in the controller. The idea is, the Solo has plenty of power for "smart" features, without taxing the core (and somewhat important) flight computer (3DR's own Pixhawk 2, for those asking). 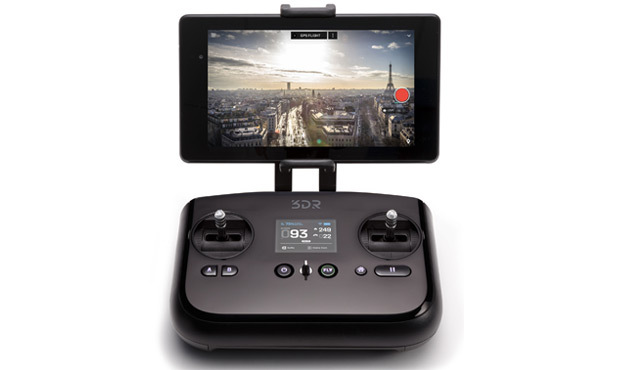 Other key features include live HD (720p) streaming direct from a GoPro to your phone (or any display via HDMI) from over half a mile away, several cinematic flight modes (more on these later), comprehensive autopilot features, and a modular/swappable "accessory bay." The cost? $1,000 (drone only), or $1,400 with the purpose-built Solo GoPro gimbal (camera stabilizer). For anything more than the most casual of filmmakers -- i.e. those most likely to already own a GoPro -- this puts the Solo in the same ballpark to the Phantom 3 Professional ($1,260) in terms of initial outlay. First-time flyers without a GoPro will, of course, have to weigh up the cost benefits of the Phantom 3 Professional over the features 3DR is offering. Colin Guinn, SVP Sales & Marketing at 3DR, explains "90-percent of our buyers already own GoPros. That means we can put more of that cost, and more of that technology into the Solo." Essentially, 3DR focuses on the drone, leaving the camera expertise to GoPro (it will be compatible with other cameras soon). Despite its name, the Solo has two sides: It's both a consumer-friendly product (Guinn says it'll be in 2,000 physical stores), yet customizable and hackable. Adding new features is as easy as swapping out a phone battery thanks to the accessory bay. Possible add-ons include indoor-flying or infrared sensors or even a ballistic parachute. Similarly, you're not tied to 3DR's gimbal, as that's swappable too. The battery bay is designed to accommodate bigger cells, and the motor pods are replaceable with just four screws. 3DR collaborated with GoPro so that Solo has direct access to the camera's settings. A simple, but huge benefit. Stop/start recording when you want, switch from video to photo, change the video mode, or basically anything you'd be able to do on the ground, directly from Solo's mobile app. No more taking off and recording 15 minutes on one setting. Or worse, landing only to find you forgot to record anything at all! Most professional aerial video requires two people: one to fly the drone, another to control the camera. Pro setups will still want that, but the Solo's "cable cam" and "orbit" modes mean you can set up fancy shots on your own. For example, fly the Solo to point A, frame a shot press a button. Next, fly to point B, frame a shot, press a button. This creates a virtual "cable" between these points, and the Solo will only fly between them in a straight line, panning and tilting the camera as it goes. Or, manually pan the camera yourself, but remain on the fixed "cable." If you've ever flown a drone with a camera and been disappointed trying to get anything beyond smooth forward or backward sweeps, you'll know how useful this will be. The Solo's appeal teeters on the brink between casual (but enthusiastic!) pilot ($1,400 for drone and gimbal isn't small potatoes), and aspiring pro user. Example: on the one hand you have some interesting cinematography modes, yet you can also share video clips directly to Instagram via your connected phone. The very definition of prosumer, perhaps? Solo also has an aggressive look -- it was designed by the same team behind the high-street products like the Nike FuelBand, and the Xbox 360 -- if you want to stand out from the white Phantom crowd. For those keen on creative filmmaking, the few hundred bucks between DJI's Phantom 3 Professional (which comes with a camera, but has fewer software tricks) and the 3DR Solo with gimbal (and GoPro) might seem pretty small. If, however, you're starting from scratch, the initial outlay on Solo (and optional, yet desirable gimbal, plus GoPro) is going to be a harder sell. Beginners might still like DJI's price and simplicity. But, if you've already got the flying bug, Solo should have you excited. 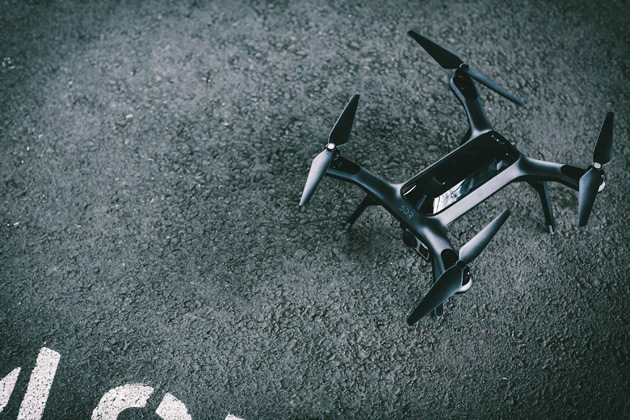 The Solo launches in May for $1,000 (drone only), or $1,400 with the GoPro gimbal.